All the information about Sushma Swaraj's life which you will not know. Sushma Swaraj Biography :- In today's times, women are making their mark in every field, but there was a time when women were not allowed to leave the house. But the change comes inevitably. Today women are contributing to the development of the country along with the house. In India's politics, women have as much contribution as men's. The women who were not even sent home in the fight Those who went abroad would not have been allowed to go out of the house. He is handling the country. And this is a good example of whether the Defense Minister of our country is also a woman and the Foreign Minister is also a woman. External Affairs Minister Sushma Swaraj - Sushma Swaraj has been active in politics for a long time. Sushma Swaraj is one of only few women who performed well in the home and the country's zimindaris. Also, as an example for women. Sushma Swaraj was born on February 14, 1952 in Ambala. Mr. Hardev Sharma, father of Sushma Swaraj was a key member of the National Self Service Commission. Because of which Sushma Swaraj saw the impact of the Union and politics from around the beginning. Although Sushma Swaraj made her own identity on her own from her father. Sushma Swaraj took law degree from Punjab University after studying BA from SD College, Ambala Cantonment. During his college studies, his habit of saying his thoughts and every thing got him the honor of the speaker. Not only this, Sushma was also the highest cadet of the NCC in the college days. Sushma also received the state's highest speaker award for 3 consecutive years. In those days there was an emergency in the country and Jayprakash Narayan was strongly anti-Emergency. The situation of people from the crisis was very bad. Given this, Sushma Swaraj also decided to become part of the movement of Jaiprakash Narayan. Sushma Swaraj took part in this movement. After this, the political journey of Sushma Swaraj started. He joined the Jana Sangh party, which is today known as Bharatiya Janata Party. Prior to joining politics, Sushma Swaraj also worked as Advocate in the Supreme Court. Sushma Swaraj also got the honor of becoming the first woman spokesperson of the political party. Sushma Swaraj was elected a member of the Haryana Assembly for the first time in 1977. During this time, he was made the Labor Employment Minister in the Haryana Government. Subsequently, in 1988, Sushma Swaraj was again elected a Haryana Assembly member. This time he was elected Education Food and Civil Minister. In 1990, Sushma Swaraj was elected the Rajya Sabha member for the first time. Subsequently, Sushma Swaraj was elected Lok Sabha member in 1996. 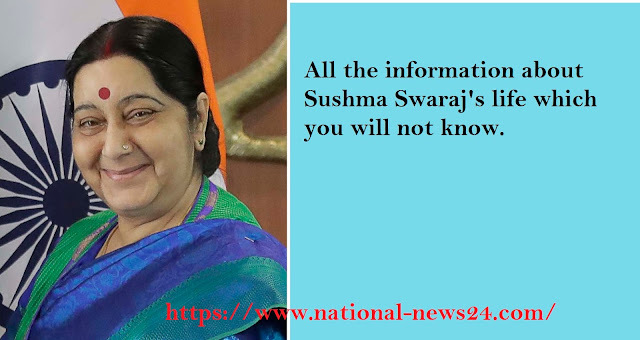 Sushma Swaraj was entrusted with the Ministry of Information and Broadcasting in the Central Government formed in 1996. After that, he became the Chief Minister of Delhi in 1998. Sushma Swaraj became the first woman Chief Minister of the country's capital Delhi. However, after some time he resigned from the Delhi Legislative Assembly and continued the post of Lok Sabha member. After this, he was again elected as the Information and Broadcasting Minister in the government of Atal Bihari Vajpayee in 2003. After that whenever the BJP government came to the center. Given the strength of Sushma Swaraj, the important ministry was entrusted to him. At present, Sushma Swaraj is a Lok Sabha member from Vidisha constituency of Haryana. Also in the foreign affairs is the Chairperson of the Parliamentary Standing Committee. Sushma Swaraj is known for her Strong Personality. Who does not hesitate to speak against anyone on the wrong. Sushma Swaraj has married Swaraj Kaushal (Sushma Swaraj Husband). Swaraj Kaushal Sushma Swaraj was working as Advocate in the Supreme Court. Swaraj Kaushal is the person receiving the post of governor at the youngest. He is the governor of Mizoram. Swaraj Kaushal has been a Rajya Sabha MP for 6 years. For the achievements of Swaraj couple, their name has also been recorded in the Limca Book of World Records. Sushma is a daughter of Swaraj and Swaraj Kaushal whose name is Sushma Swaraj Daughter, the flute is studying advocacy in the inner temple of London. External Affairs Minister Sushma Swaraj has several records. Sushma Swaraj has been a spokeswoman for the state for three years. After coming to politics, Sushma Swaraj became the first National Minister of the Bharatiya Janata Party. After this she became the BJP's first female national spokesperson. She is the BJP's first woman minister in the cabinet. Sushma Swaraj is the first woman to get the honor of the best parliamentarian in the Parliament of India. Apart from this, he is also the first woman chief minister of the country's capital Delhi. Sushma Swaraj is also proud of being the country's first woman foreign minister. It is difficult to believe that at that time when many women were unaware of their existence and rights, there were women like Sushma Swaraj who, despite not having political background, walked in politics and remained active in politics. In the field of politics, from the first woman chief minister to the first woman foreign minister, she not only made every record her name but also motivated women to come to politics to change the country. He is still contributing to the development of the country as an External Affairs Minister, visiting many countries, he is on the side of doing good to his country's relations with other countries, but this work is also very good at this age. Is doing from He is also handling his own house.